What is it about bacon? Everything, or nearly everything, is truly made better with bacon. Kristen’s here visiting and eating good food is always on the agenda with the two of us together. We stayed in last night and what did we make? Beer, Cheddar, and BACON Risotto. It was delicious…though, not-so-healthy. We had a few scallops to go with it and a brussels sprout and dinosaur cabbage salad. It was divine. Diiiiiiivine. Dessert? Her dad’s famous Peanut Butter Pie. It’s one of the guiltiest of pleasures, no doubt. Last week I made this BLT Pasta for Mr. Prevention and I. I’m not even sure where I ran across the recipe, but its simplicity is what drew me in…along, of course, with the bacon itself. And pasta? I’m sure it could be considered a pregnancy craving, of sorts…let’s go with that. I’ve definitely been enjoying pasta as of late. It always sounds good to me. But in fairness, there’s no off-putting foods, so I guess nothing has really changed. I’m going on a bacon cleanse until later this week when I’ll use up the last few slices in my fridge to make Ultimate BLT Grilled Cheeses. 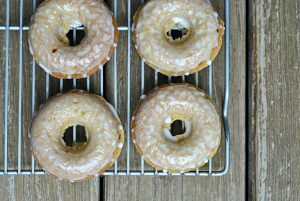 I’ll endeavor to find a way to lighten them up some, but not everything with bacon has to be over-the-top sinful. 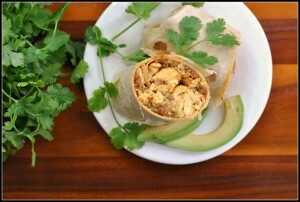 This recipe, for example, comes in at 304 calories per serving and a respectable 7 grams of fiber. Nothing not to love about that! Simple, quick meal with lots of flavor. I added more tomatoes and a bit more pasta to stretch the bacon and portion size. Delicious! 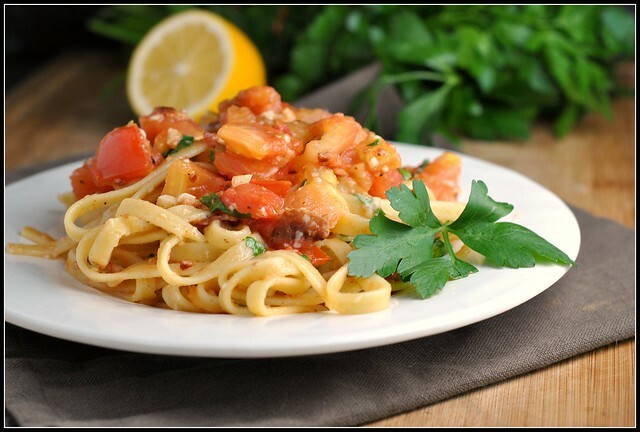 Bring 2 quarts of water to a rolling boil in a medium pot; add pasta and cook 8-10 minutes or until al dente. Drain and keep warm. Meanwhile, in a large skillet, cook bacon over medium heat until crisp. Remove to paper towels; drain, reserving 2 tablespoons drippings. Saute tomato and garlic for 1-2 minutes or until heated through in the drippings over medium heat. Stir in the bacon, lemon juice, salt and pepper. 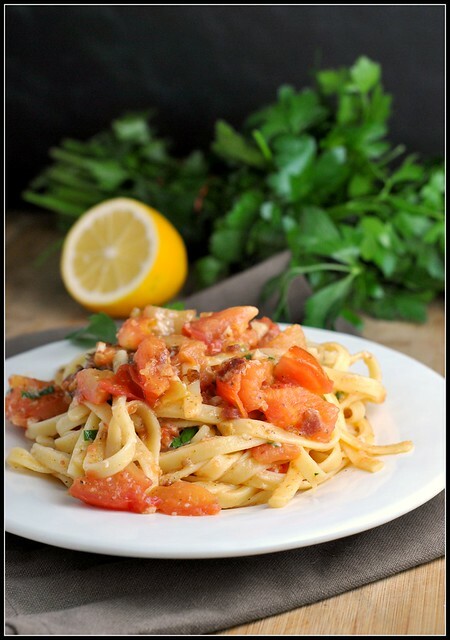 Toss the cooked linguine with the tomato mixture in the skillet and sprinkle with cheese and parsley; toss to coat. Serve hot. P.S. I’m loving Hopeless on my Kindle. Love, love, love. I’m glad that you are saving your bacon for the Ultimate BLT sandwich because it is the best! I don’t eat bacon too often, but every time I do, I’m reminded why I love it! This pasta looks incredible too! 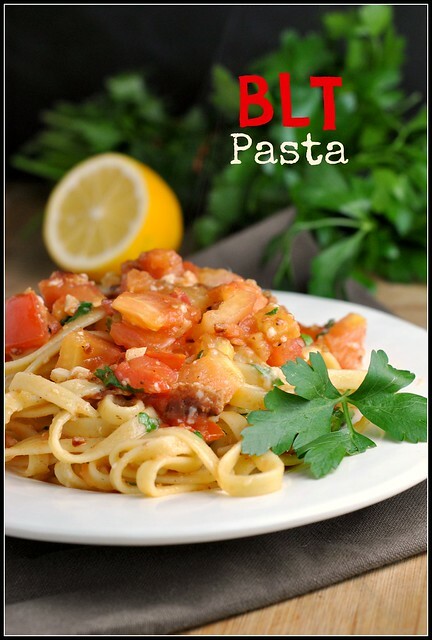 BLT anything is the best…but this pasta looks especially amazing! Like you said, bacon really does make everything better! I LOVE BLT sandwiches but never thought to throw it into a pasta dish. This looks so hearty and perfect for spring. 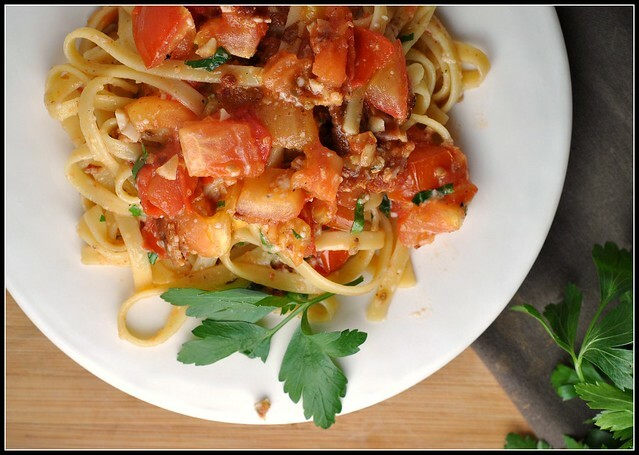 This is the best type of easy meal to make, especially when tomatoes are in their prime!